The Lion Guard: Return of the Roar continues to explore the pride lands that we were introduced to in The Lion King, one of the most beloved animated films ever to come out of The Walt Disney Studios. This time however, The Lion Guard is geared towards preschoolers. The story here centers on Simba's son Kion. Kion and his best friend, a honey badger named Bunga who was raised by Timon and Pumba, love to explore the pride lands. Then one day Kion discovers his roar and Simba and Rafiki reinstate The Lion Guard, a league of pride land protectors. Kion then then selects a team of animal friends to help him guard the kingdom. The movie remains faithful to the original movies. 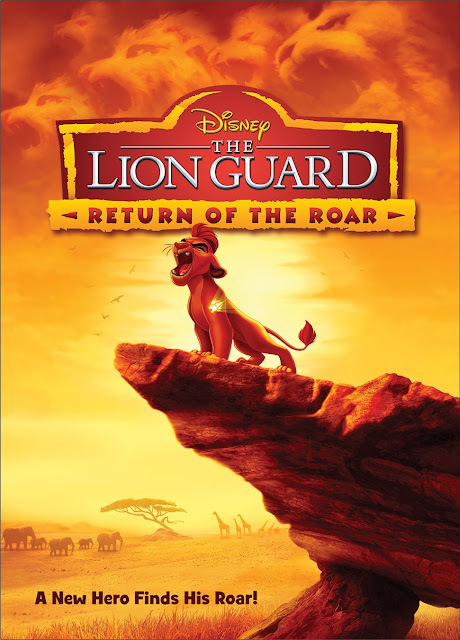 There are several callbacks to the original film with references to song titles, color schemes and even some of the voice actors including James Earl Jones as Mufasa. The songs are catchy enough for the target audience. There is one bonus feature on the DVD. "Here Comes the Lion Guard" music video by Beau Black is the very catchy theme song. There is also a physical bonus item that comes in the DVD, a talking backpack pull. It is a plastic version of Kion's head that plays the phrase, "'Til the Pride Lands end, Lion Guard defend!" The Lion Guard is a great way to introduce preschoolers to the world of The Lion King. Fun new songs and new characters in a familiar environment will make this a great addition to your child's DVD collection.